Finally Leadingcourses.com has introduced filters on review pages of golf clubs that have more than 20 reviews. Leadingcourses.com is very proud of this new and important step. It is a sign that more and more golfers share their reviews on the platform, which enables us to provide even more relevant and more personal advice to the golfers visiting our site. When Leadingcourses.com started 10 years ago, nobody really believed in the concept of reviewing golf courses. How could golfers decide whether a golf course was any good or not? That was actually the attitude reflected in the golf industry. The golfer did not really matter. But then the recession hit and times changed. Golfers started to flock away, ended their memberships and became a ‘scarce commodity’. Now, golf courses have to try harder. Why should a golfer play at their course or become a member? What makes them special? And, with the rise of review and booking sites like TripAdvisor, Booking.com, Expedia and Yelp, what is their online reputation? These are all specific factors that golfers are paying close attention to nowadays. At first, golfers were hesitant to write reviews on Leadingcourses.com, journalists didn’t want to help because rankings and ratings were poor and, due to the prospect of negative reviews, golf clubs were not that willing to help either. Nevertheless, slowly but steadily, the site started to create fans that finally helped kick-start the platform. They started sharing their opinion, they invited their friends and our ratings started to improve. In the past ten years that has led to more than 350.000 reviews. 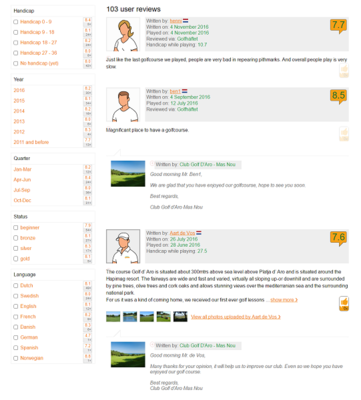 When certain golf courses had received more than 600 reviews, Leadingcourses.com started to hit some boundaries. The loading time of review pages started to reach critical levels and showing hundreds of reviews isn't very helpful for golfers. So finally, with enough reviews, Leadingcourses.com could do what they always wanted. From now on there are filters on all review pages for golf clubs that have more than 20 reviews. If there are less than 20, all reviews are shown all without a filter. Leadingcourses.com is very proud of this new and important step. It is a sign that more and more golfers share their reviews on the platform, which enables us to provide even more relevant and more personal advice to the golfers visiting our site.